I finished my Botanical Illustration class. For details on the class, check here. This is my final piece. I am totally amazed at what I did in this class. I didn’t think I could really draw much of a flower, let alone, have it look realistic. But I did. I am so glad I challenged myself creatively and went out on a limb to see what I’m capable of doing. The past several months, I have done landscapes, pastel sunsets and flowers. It has been an interesting journey. I want to continue to explore painting like this. But for now, I’m going to go back to abstract art. That where I am comfortable. I have so much more to learn in that area. I’m excited to see what happens now that I’ve taken a side trip from abstract. Hi Kerry, I just noticed that for some reason your blog has been turned off from following. So frustrating, this happened on a number of blogs I follow when I was away on vacation. I re-followed today and hopefully can catch up soon. Your hibiscus is fantastic – love the background as well. The flower petal colors are gorgeous – it’s one of my favorite of your paintings. Thanks, Mary. I’m glad you’re reconnected to my blog. Thanks for your comments. Thank you Lorie for your comment. I’m so glad you like my art. Thank you for your prayers. That means a lot to me. One of my favorites! So vibrant Kerry! This is really lovely, Kerry, congratulations! Thank you so much. It was so fun doing this. Oh, thank you so much! I am very pleased with it. It’s from a photo I took in Maui. It’s a little bit of both. At this point, I rely heavily on a reference photo to draw from. But I’m working towards just being able to draw whatever I want in my art. But I’ve never looked that closely at flowers, so I needed a photo to give me an idea of what was going on with the dark and light areas. Apparently more than I thought. 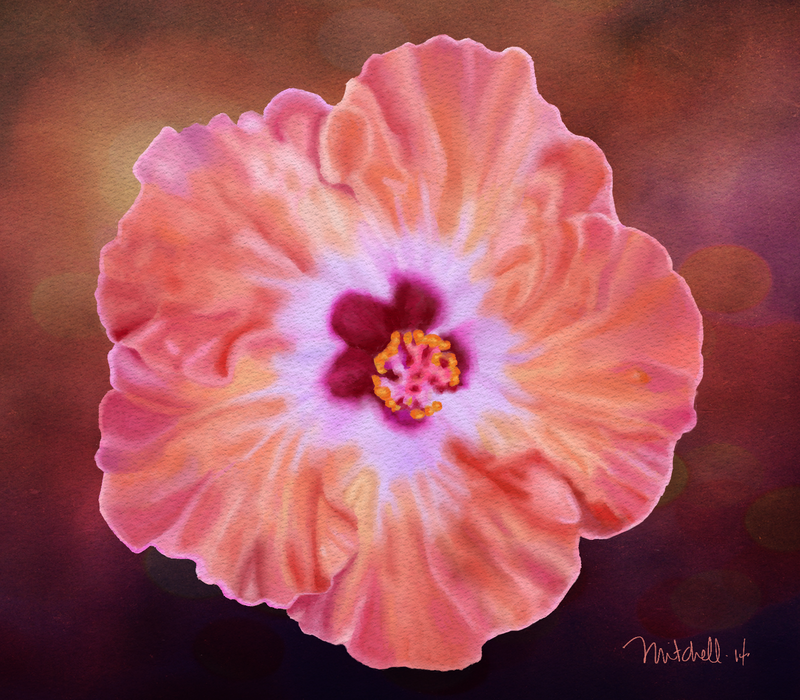 I never dreamed I could paint like I did with the hibiscus. On a lark, I signed up for a botanical illustration class. This is what came out of it. The classes at DAA are very good. There is an introductory class on Painter that really helped me. Thanks again. That is so encouraging. Thank you so much. I am so glad you enjoyed it, Trisha.